Shahi Paneer is a mild curry in which Indian cottage cheese is cooked in rich and creamy gravy. 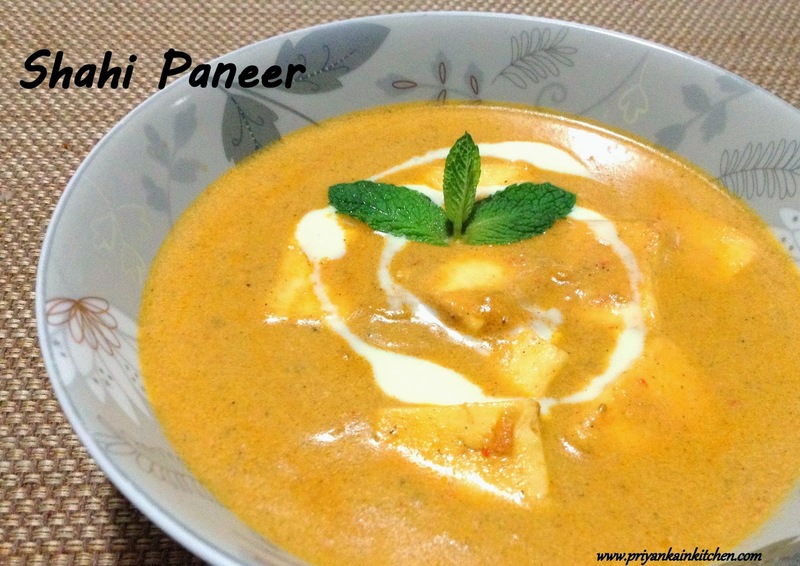 It is one of the most loved and popular paneer curry. Easy to make, this curry can be served with any Indian bread or rice. In a pan, heat oil. When hot, add onion & chilies and stir fry them until onion starts to turn golden. Add tomato and again stir fry until they soften. Transfer them to the grinder and grind to a smooth paste. Normally no water is needed, but if needed add minimal. Again transfer this paste back to pan. Add all the spices except salt and cook until it starts to boil. Now slowly add milk to it and let it cook until everything comes to a boil. You may need to adjust the consistency of gravy using milk or water. Add salt and paneer. Let it cook for 2-3 mins on low heat. Serve hot with your choice of bread or rice.